Hey all. Tomorrow is Valentine's Day and I am extremely excited! Just want to share my Valentine's eye make up look. Instead of the traditional pink or red, I decided to use orange and some glitter =) Well, it depends on invidual preferences and personality of course. So, here are the products and I use and I will detail how to create this look step by step. 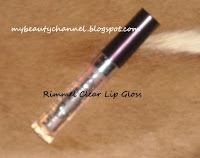 Next, I took a clear lip gloss from Rimmel and coated it lightly over the orange shadow on my lid, crease and lower lash line. This serves as a sticky base for the glitters to adhere to. Make sure you do not apply too much of the lip gloss because it will crease very quickly. Now comes the fun part - the glitter! 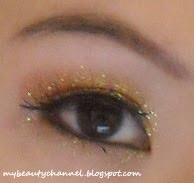 =) I used a concealer brush to DAB (not sweep) the glitters more onto my lid and crease and a little on the lower lash line over the orange shadow. Remember to dab the glitter on gently and make sure you use cosmetic grade glitter. 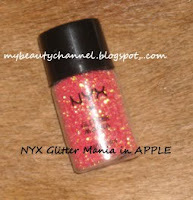 I am using NYX Glitter Mania in Apple. On my browbone, I used a matte cream color since we already have so much glitter on the lids :) This is from Averine Skin Caring Eyeshadow Duo in ED06 Coffee Break. 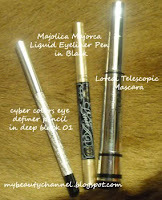 Then, I lined my upper lash line with Majolica Majorca Liquid Eyeliner Pen in Black and winged out the liner for a more dramatic look and applied Cyber Colors Eye Definer Pencil in Deep Black 01 on my lower waterline. I finished the look with false lashes and a coat of Loreal Telescopic Mascara. I hope you guys like this and stay tune for more tutorials. Happy Valentine's Day and be safe. Thanks Cocamia for your kind comments =) I kinda love the look too. Still practicing and hope to improve to provide better tutorials. Thanks for the visit and you have a wonderful day! I'm a curious person, with great passion in romance, beauty and health. I'm a beauty and health addict. I don't mind spending extras for quality products. Having the passion for beauty encourages me to continue learning through reading, surfing, experimenting, etc. There'll be posts on beauty tips and secrets, some make up ideas, hair care tips, reviews on products, my beauty hauls, health care, cosmetic, skin care tricks and more. Click here to view my beauty profile! I cannot guarantee the same results for all products that I've reviewed here because we have different skin types. I'm also not affiliated with any companies. I will only do reviews on products I'm using or products I find worth investing. The main purpose I started this blog was to share beauty and health ideas. I'll not be doing reviews unless the product is really awesome or otherwise. If you would like to contact me, I'm reachable at divineh2o@hotmail.com.